You may be forgiven for thinking that a tree is just a tree, but in fact it can be so much more! These days nurseries are really getting adventurous and selling trees in many different shapes and sizes. This is particularly useful if you want to add height to a garden but don’t have the room for something which if left to its own devices may ultimately outgrow its space. 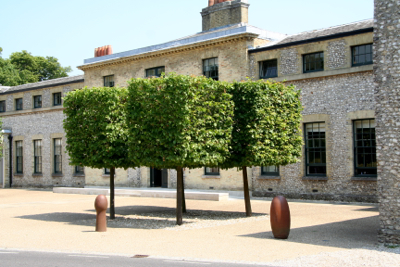 I find standard trees particularly useful for screening purposes – especially as many standards are sold with a bare stem of about 2metres which means all the bulk sits above a fence or wall and is perfect for giving my clients privacy from their neighbours. 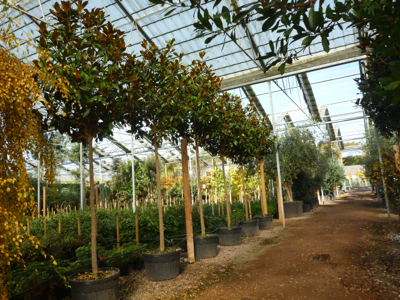 Popular evergreen (or semi-evergreen) varieties sold as standards include laurels (Prunus lusitanica), Privet (Ligustrum lucidum), Photinia ‘Red Robin’, Quercus Ilex and even Magnolia Grandiflora. Costs vary hugely and are a reflection of growth rate of the trees in question. Pleached trees are another seriously useful tool in the ‘screening out your neighbours’ battle. They give the height but are wide rather than deep which means they sit happily next to a boundary wall or fence without hanging over it. 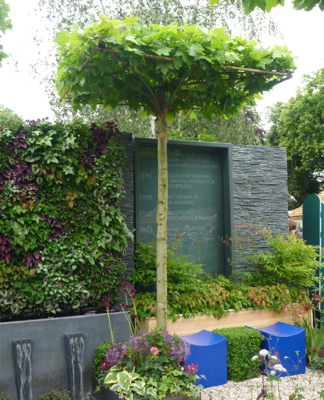 Used in quantity, you can completely enclose a garden with pleached trees, so it’s hardly surprising that they are being used more and more in city gardens. Unless you’re buying mature trees, the framework which the trees are trained on will remain visible for a few years, so you need to be prepared to look at it for a few winters when deciduous trees drop their leaves. Pleached trees are also very effective to create an avenue or vista along a path, or even to divide up a garden into different areas. 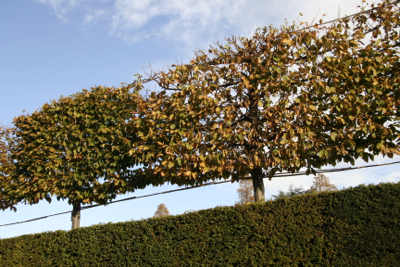 As there’s a fair bit of training involved in pleaching trees, growers have to use pliable species, and they tend to be mainly deciduous trees – Hornbeam (Carpinus betulus), Lime (Tilia), Maple (Acer campestre), Pear (Pyrus chanticleer). I’ve also recently seen Photinia Red Robin as a pleach, so there are some evergreen trees available in this form, and I’m sure this is an ever-evolving business. Taking things a bit further, you can also find ‘Box pleaches’ – basically cubes on legs. Hornbeam is a good candidate for this kind of treatment. In fact Hornbeam is a pretty good candidate for most shaping. I have used it recently as a rounded standard tree which will be allowed to get quite shaggy, making it a formal tree but not overly so. And who knew that a tree could double up as a parasol?! This is a lovely way to create a shady area for seating or dining, especially when a group of parasol trees are grown together. Like pleached trees, these parasols are grown on a framework of canes, and will take a while to mature. But if you have the space and the budget, then they definitely make a great feature for a garden of any size. Coppicing trees is another way to keep them small in a restricted space – or in some cases to ensure you have big bold foliage. This is very effective for trees with large leaves such as Paulownia, Catalpa and Cercis. 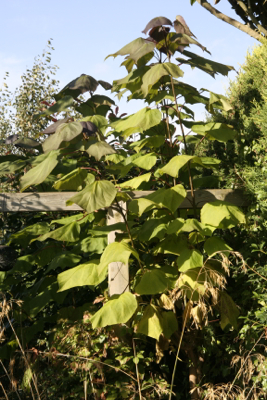 I have a Catalpa erubescens ‘Purpurascens’ in my garden which I cut back religiously every winter and the head stays compact at a total height of about 4 metres, with beautiful bronzey, purple green leaves. Other more traditional candidates for coppicing include Hazel (Corylus), Willow (Salix) and also shrubs such as Cotinus and Sambucus. Many trees are now grown as multi-stem specimens which means you get more bang for your buck in terms of interest from colourful bark for example. 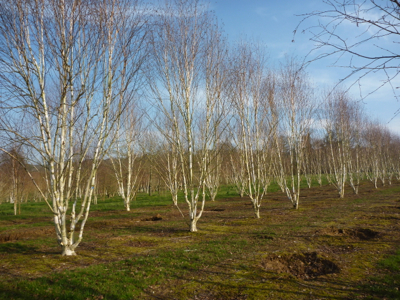 Prime candidates for this treatment are Betula (Silver Birch and River Birch) and Prunus serrula which has gorgeous mahogany bark. 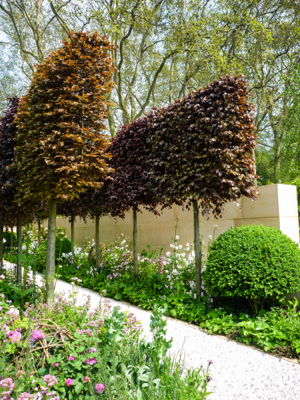 Something I’ve noticed happening a lot at the Chelsea flower show is ‘raising the canopy’ where lower branches are taken off a small tree or large shrub to give a multi-stemmed look. 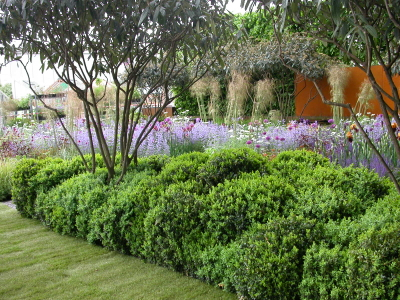 It can have a very sculptural effect and make a relatively boring shrub look really special. I remember the interest at Tom Stuart Smith’s Chelsea garden years ago when he used what is a pretty drab shrub under normal circumstances – Viburnum rhytidophyllum – to do just that. It was the talk of the show! Fruit trees of course have been manipulated into all sorts of weird and wonderful shapes for many many years. 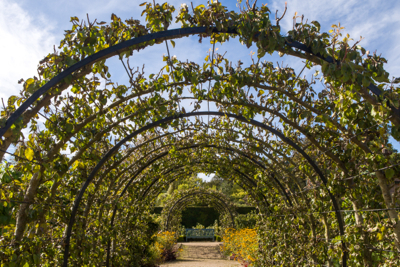 I love to see apples and pears grown over arches to create a fruit tunnel. Delicious in so many ways! 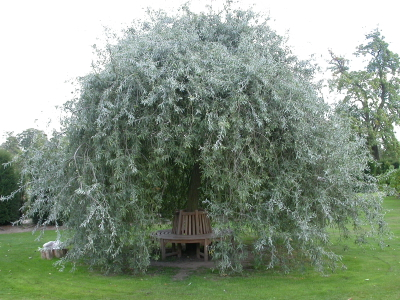 One of my favourite small trees is the silver-leaved weeping pear, Pyrus salicifolia ‘Pendula’, and I love how it’s used at Loseley Park near Guildford, where the canopy has been cut through just enough so that it’s possible to get through to a seat surrounding the trunk. It makes the perfect secluded spot to sit in the shade of the canopy. As the traditional bare-root and rootball tree-planting season (November to March) comes to an end, it’s good to know that a lot of the pleached and standard trees (particularly evergreens) are often supplied in containers – which means they can be planted at other times of the year too. Good news all round.